Love. What makes anyone think they know just what that is. Or who to love. Or how. That thinking describes absolutely no one in Puerto Vallarta or anywhere around the stunning Banderas Bay. That’s why from the tip of Punta Mita to the southern shore of Yelapa, Puerto Vallarta is constantly chosen as the #1 LGBT friendly, world-class, drop-dead gorgeous, kicked-back, glammed-up, pulsing hot, totally cool, vacation destination in the world. We’re the first place in Mexico to receive the “Gay Travel Approved” distinction by GayTravel.com. The entire Bay of Banderas, particularly Old Town and the Romantic Zone, is filled with LGBT-friendly businesses, stores, bars, nightclubs and hotels from budget to boutique, including the elegant, gay-owned and operated Oceano Sapphire Beach Club. 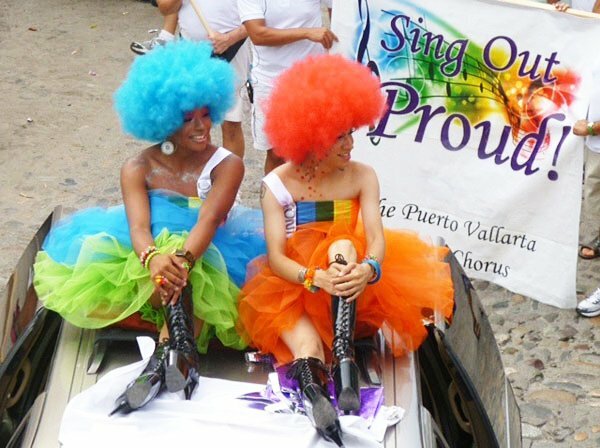 The LGBT community has always been welcomed here in the Puerto Vallarta area, with open arms. We host the annual Gay Pride march. Support Pink and Proud Women’s Party and so much more. 3 of 10 hotels around the Bay are LGBT friendly and offer weddings and other symbolic ceremonies from simple to elaborate. We’re also home to the International LGBT Business Expos and conferences. Fashion shows, parties and music events, great theater and clubs. You can take the Gay VIP Bars tours. Down a few “Gay tequilas” and get up again with a “Gay Energy “drink. Then hit the sand at Playa de los Muertos, a world famous, LGBT-friendly beach, where you won’t raise a pair of shades or an eyebrow. Love is what Puerto Vallarta is made of and made for. From the warm-hearted people to the warm sandy beaches to the delicious food from cuisine to food cart. You may have left your heart in San Francisco, but you’ll never want to leave Puerto Vallarta and the entire Banderas Bay. Puerto Vallarta - the top gay friendly destination in the world!